Last summer, I built a bike in the Kenyon Bike Barn. I first volunteered at the Bike Barn during my first year at Kenyon, and liked it so much I decided to help out again over the summer, when I was on campus doing research in neuroscience. Our job is to fix student bikes during our open hours and refurbish donated bikes in order to sell them. We accept bikes, bike parts, and cash donations year round and are a free service to students and community members. The money we make from our sales goes to Pelotonia, a cancer research foundation that raises funds via a huge 100-mile bike race from Columbus to Gambier every August. Before coming to Kenyon, I had never even changed a tube on a tire, so this was a significant milestone for my skills as a handyman. We have a lot of “project bikes” down at the Bike Barn, which are typically rusty, old bikes that were chained to a rack through the winter and left there when campus cleared out for the summer. The bike I rebuilt was hanging by its grass-encrusted frame with its equally beaten-up wheels removed. After deeming the bike salvageable (from a safety perspective), cleaning it off and de-rusting it as well as I could, I uncovered that it was a 1984 Schwinn World Sport. For context, Walmart sells a lot of not-so-great Schwinn bikes today, but they ran pretty well back when bike companies built everything out of steel. Over the span of two weeks, I took all the parts off and put everything back together, exchanging the parts that were no longer safe (the brakes, for instance) for used parts that we had around. After a lot of hard work and elbow grease, I could ride it down the street! I really enjoyed this project. Coming out of it, I am a lot more confident in my ability to troubleshoot people’s bike problems that come through the door during our open hours. I can tune your derailleur, true your wheel and fix your brakes with much greater precision. Alongside that, the feeling of completing something is great. Especially on days where my summer science project wasn’t going as well as I wanted it to, it was awesome to go cover my clothes in bike grease and watch this bike come together. We sold it to my friend Ben for $40, and he has gotten a lot of great use out of it. It’s fun to see that bike and all the others I’ve worked on zip around campus. On my campus tours for prospective students, I always get questions about bikes. “Is Kenyon a biking campus?” “Do I have to buy a bike if I come here?” The easy answer is “no, you don't need to buy a bike.” At Kenyon, you are never more than a 15-minute walk from the athletic center, dining hall, or your room. You do not have to purchase a bike to get from place to place on our campus. That being said, if you have an 8:10 class that is an eight-minute walk from your residence hall, buying a bike also buys you five more minutes of sleep, which will seem more and more appealing as the semester progresses. 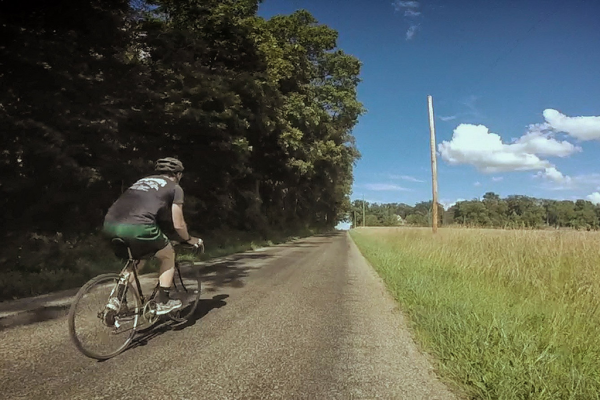 Moreover, there’s nowhere better to go for a bike ride than on a nice day in rural Ohio. Especially in the fall, the 14-mile Kokosing Gap Trail is beautiful. There’s a reason that Pelotonia finishes here. In short, there’s no need to come buy a bike from the Kenyon Bike Barn — but if you do, you will be happy you did.